In a continuation of my last post, I'm going to check out a few more music players. Again, these are development versions, and they might be different from the current stable versions. 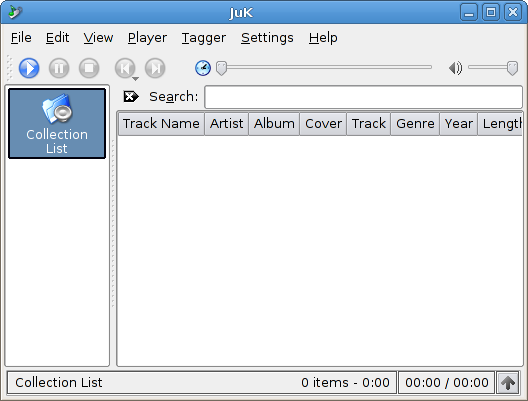 JuK seems to be another popular player for KDE. The easiest way to describe it would be having the interface of Amarok with the feature set of Rhythmbox. It basically plays music and lets you organize your library, and that's it. There isn't any plugin support, so if you don't like the features it has you cannot do much with it. That said, JuK has an easy, intuitive interface and is a great way to just listen to your music without all of the thrills of other players. 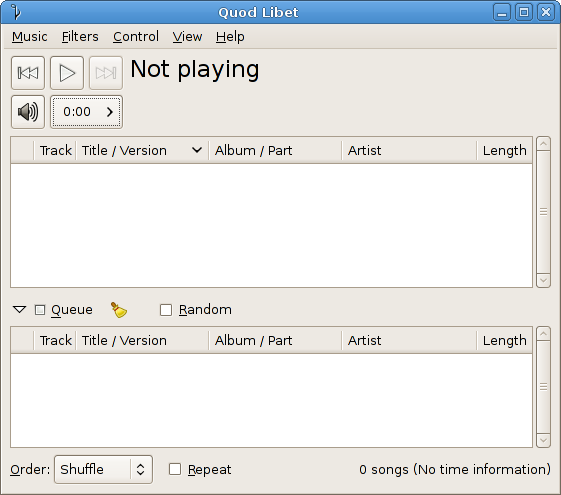 At first glance, Quod Libet seems to be just another simple music player. 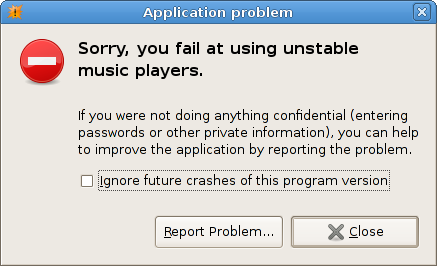 However, that is all changed when you open the Plugins dialog. 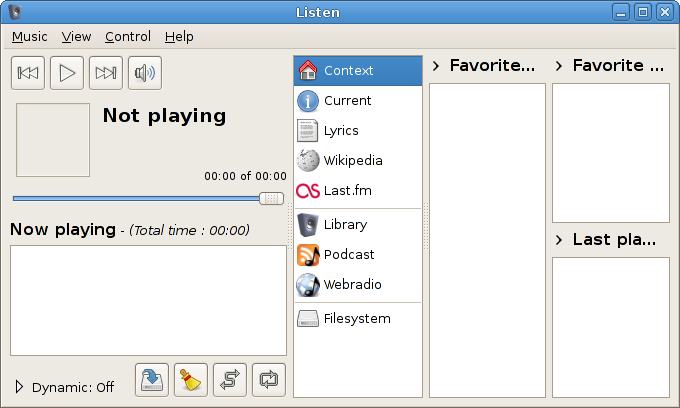 Quod Libet comes with over 30 plugins to activate, ranging from a tray icon to a music alarm clock. It has multiple views, such sa Paned Browser and Internet Radio, so there is always a new way to look at your music. It comes bundled with Ex Falso, a tag editor accessible as its own application and from within Quod Libet. 2 more players after the jump. 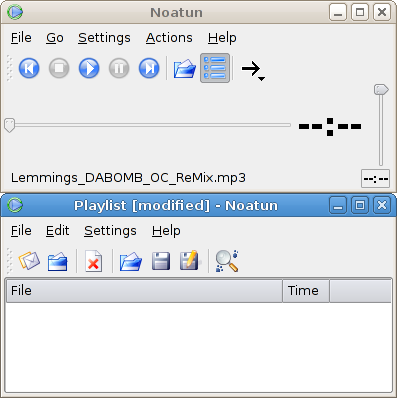 Noatun seems to be very simple on the outside, however most of its functionality is in the menus. It uses a multi-window interface, and there are a few plugins to get you started. It has a few more features than JuK while having a less obvious interface. It is another good music player for just listening. Listen seems to be a good player if you have a widescreen monitor: the interface extends horizontally. It seems to be a player that is very tightly integrated with web services; if you cut out your connection you lose a bunch of features. It has the right amount of features for any user, however it lacks plugin support. I wasn't able to test these web features much either, since I was using an unstable version that crashed every time I tried. This player seems to have a bright future in store. There are a lot more music players out there than the 8 I reviewed. I encourage you to try them all out and submit your opinions. My personal preference? Rhythmbox. The primary reason I use it is because it comes with GNOME and it does what I want. After looking through all of these (and more) I might have to change.